Toybank, as an organization believes in the Power of Play. It believes in developing the mental ability of at-risk children through programs and initiatives that particularly focus on behavioral and mental growth in their early childhood years. Toybank, through collaborations have been conducting Play Sessions at Schools, Community Centers, NGOs, and Hospitals, where in the course of educational toys & games – their skill sets are developed. Although, Toybank alone cannot fulfill its objective of each child having their right to play. The Volunteer Action Program is held so that Toybank can have volunteers that contribute towards fulfilling the same. The job profiles of these volunteers vary from volunteer to volunteer based on the skill sets they have and the requirement of the organization. To let the potential volunteers know about Toybank and its work, a volunteer induction is held before their joining, where the detailed information is given by a member of the organization. 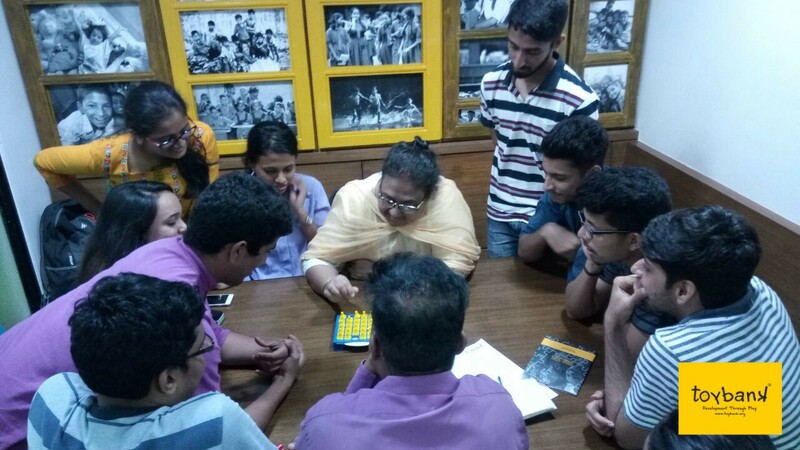 The Volunteer Induction for the Toybank Volunteer Action Program was held at the Toybank office in Mahim on 11th May, 2018. The Induction had a total of 10 members present who had come either by reference or through their search on online portals.The Induction began with a round of introduction of the volunteers who came from various educational backgrounds. After which, we, introduced Toybank, the history of Toybank, Shweta Chari, the CEO’s thought process behind starting the organization, the Seriousness of Play, and its impact on children. It was a very interactive session where the volunteers asked questions regarding their doubts, the kind of toys & games that are played, and the type of volunteering that can be done. Some of the volunteers also personally came and asked questions and interacted with the VA team. Toy Story – Our Better World Jan 2013, a film made by Toybank was also shown to the volunteers which emotionally impacted them and they were fascinated by the work Toybank had done so far. After the Introduction, the volunteers were invited to play Memory Skills, a game that requires you to pay attention and memorize pictures, for which during the first round they seemed nervous but after they started getting a hang of it, the competitiveness and their attention towards the game increased. They started enjoying and commenting on each other’s moves, which made it all the more fun. The Induction ended with the volunteers signing the Promise Card and the volunteers promising to assist the organization in any which way they can.